Instant Pot Lasagna, I think, is the best lasagna recipe! It tastes delicious, and you can customize it to your taste, adding any of your favorite ingredients!. 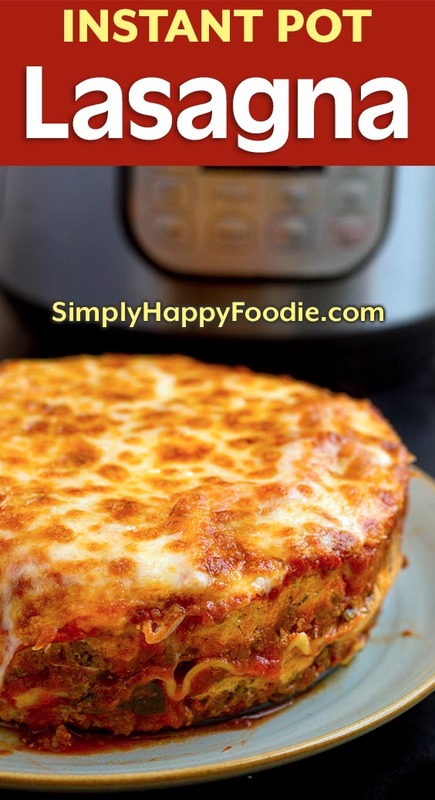 Did you know it is very easy to make lasagna in a pressure cooker? You don’t have to boil the noodles first, so that’s a win in my book! 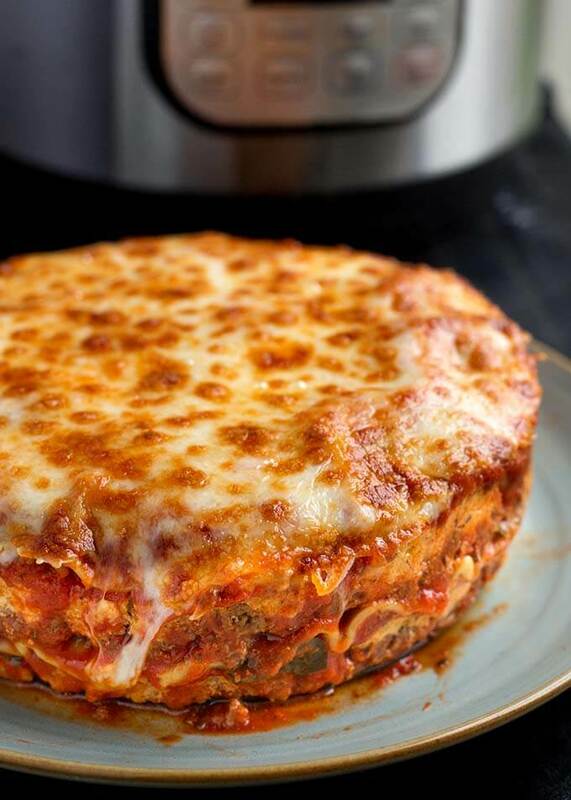 If you are in the mood for some tasty Italian pasta, make this pressure cooker lasagna recipe. This pressure cooker lasagna recipe is one of my most popular recipes! Often copied by others, but this is the original version of this recipe. 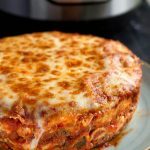 The favorite Instant Pot lasagna recipe of thousands who have made it! Thank you all for your wonderful feedback and comments! My husband, Paul makes a fantastic lasagna! He adds spinach, mushrooms, and other good stuff to it. His recipe makes a huge pan of it, and it lasts us for days! I wanted to make some in my Instant Pot electric Pressure Cooker, and see if it would turn out as good as his. And would it be any faster? Well, he doesn’t cook his noodles, so I didn’t want to cook mine, either. I found some no-boil noodles that work perfectly (regular lasagna noodles worked as well, but the results were best when I soaked them first in very hot water for 15 minutes.). He does a lot of chopping, and I wanted an Instant Pot Lasagna recipe where I could get good flavor without so much chopping. I turned to my pantry for some seasonings. Garlic powder, onion powder, and a few others did the trick! Saved some time there. Spray a 7″x3″ springform pan with cooking spray. Layer uncooked noodles in the bottom. Layer sauce, meat, and cheese mixture. Repeat layers two more times. Cover with a piece of sprayed foil, set on a trivet with handles (or use a sling) and put it in the pot. Pressure cook and let it naturally release for 10-15 minutes. 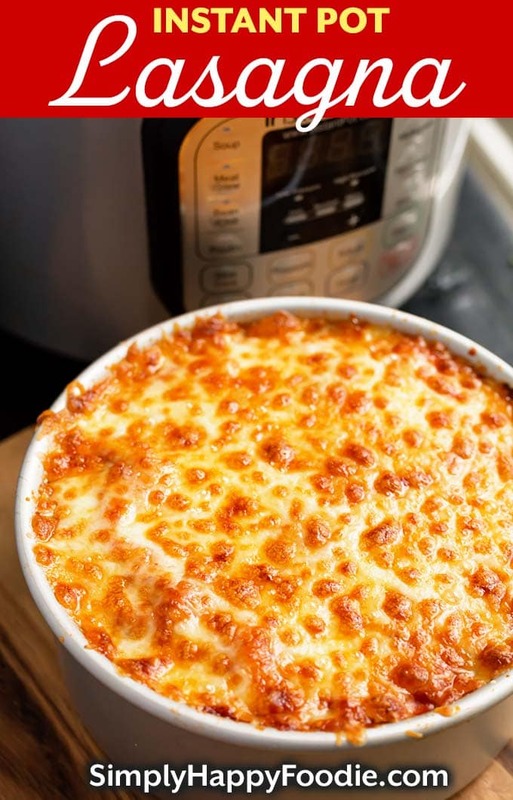 Broil the top of your Instant Pot Lasagna to brown the cheese. • Gather all of the ingredients and kitchen tools you will need. • Cook the Meat with some seasonings so it isn’t bland. • Prepare the cheese mixture. • In a 7″x3″ springform or push pan, start the layering with the no-boil noodles, which you will need to break apart to fit the shape of the pan. • Next, layer 1/3 of the sauce, 1/2 of the meat, then 1/2 of the cheese mixture, and the spinach (optional). • Start again with another layer of noodles, 1/3 sauce, 1/2 of the meat, 1/2 cheese mixture. • Then noodles, sauce, and top cheese layer. • Cover with a piece of sprayed foil, set on a trivet with handles (or use a sling) and put it in the pot. Set the cook time and let it naturally release for 10-15 minutes after pressure cooking. • Broil the top of your Instant Pot Lasagna to brown the cheese*. *Broiling is an optional step, and you can brown the cheese as much as you like. This is what a foil sling looks like, if you need to use one. Take a 24 inch length of foil and fold it over 3 times the long way. You will have a sling that is 3″x24″. 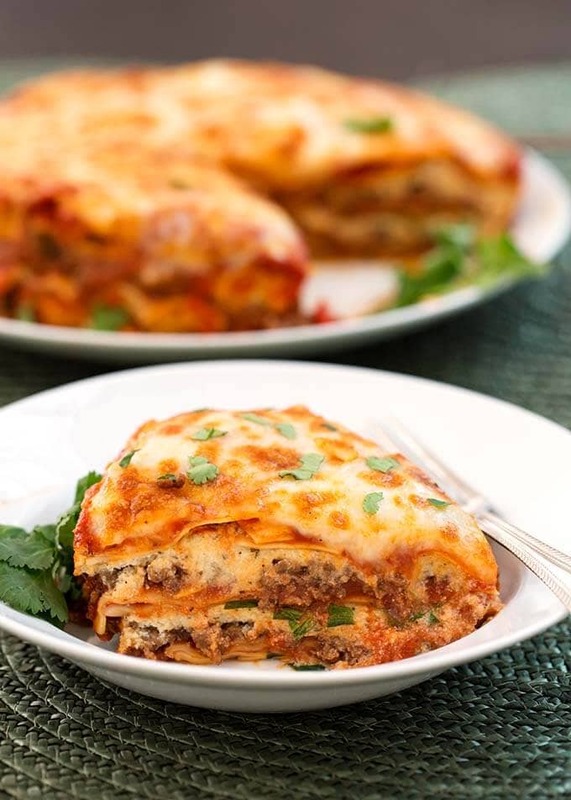 Enjoy this delicious Instant Pot Lasagna! Instant Pot Lasagna is delicious and hearty. No need to pre-cook the pasta if you use no-boil noodles. Pressure cooker lasagna is easy to make. Set pot to Sauté and add the beef, sausage, salt, pepper, onion powder, garlic powder, and Italian seasoning. Cook, stirring, until the meat is cooked. Remove meat, drain, and set aside. Clean out pot and add 1 1/2 cups water to it. In a mixing bowl combine the ricotta, egg, mozzarella, parmesan, garlic powder, onion powder, Italian seasoning, oregano, salt, pepper, and parsley. Use a fork to mix thoroughly. Set aside. In a 7" x 3" or 6"x3" springform or push pan, make a layer of the no-boil noodles by breaking them and fitting them like a mosaic to cover the bottom of the pan. Spread 1/3 of the pasta sauce over the noodles, covering them all. Spread 1/2 of the meat mixture over the sauce evenly. Spread 1/2 of the cheese mixture evenly over the meat. Sprinkle the spinach (if using) over the cheese mixture evenly. Add another layer of noodles, press down on them a little. Add another layer of 1/3 of the sauce. Add the second half of the meat. Add the second half of the cheese mixture. Add another layer of noodles, the last 1/3 of sauce, 1/2 cup of mozzarella, and 1/2 cup of parmesan. Spray a piece of foil with nonstick spray and lightly cover the pan with the foil, enough that water can't get in. Set the pan on a trivet with handles and lift them into the inner pot that has 1 1/2 cups of water in it. You can also use a sling to set the pan on the trivet in the pot. Close the lid and lock in place. Turn the steam release knob to the Sealing position. Press the Pressure Cook or Manual button (or dial) and choose 24 minutes. It will take about 5 minutes or so for the pot to come to pressure. When the cook cycle has ended, let the pot sit undisturbed for 10-15 minutes (10-15 minute Natural Release). Then, turn the knob to the Venting position to release any remaining steam. When the pin in the lid drops down, open the lid. Use silicone mitts, sling, or good pot holders that can get wet to lift the rack with the hot pan out of the pot to a cooling rack. Be VERY careful as it could slip off the rack. Carefully remove the foil. Turn on your broiler to 450° with the oven rack in the middle to top 1/3 position in the oven. Set the pan on the oven rack and let the cheese on top brown to your desired amount. Watch it closely as it doesn't take very long. Every oven is different! Let the lasagna rest for a few minutes before releasing from the pan. This will help it maintain its shape and cool down just a bit. Carefully (pan and lasagna very hot) release the lasagna from the springform pan while it is on a plate. If you used a push pan, set a large can of soup or veggies on a plate and set the push pan on top of the can. gently, and carefully push the sides of the pan straight down. Wear oven mitts or some kind of hand protection. The pan and the lasagna will be very hot. Then slide another plate under the lasagna. You might need to use a spatula to help slide it over. Serve with salad and some crusty bread! This recipe works best in a 7"x3" springform or push pan. It will not fit in a 2" deep pan. Hi Shelise, you do need the inner pan on a rack with water underneath. The lasagna is too thick and the pot needs thin liquid to make the steam that builds up the pressure. I don’t know much about instapot inserts. It looks like you are using something other than the Instapot itself. Can you tell me more about that and how to use it? Thank you! I will definitely look into the Facebook group. I’m learning so much! Did you just use a spring form pan? Can you use an oven safe baking dish on the trivet? Hi Cyndee, I have used both a springform and a push pan. If you have neither of those, most oven safe cooking dishes will work. Glass ones increase the cooking time by a few minutes, metal, keep it the same. Please check with the maker of the dish to make sure it is pressure cooker safe, just to be sure! Is this recipe okay to make and freeze before you put it in the Instantpot? Hi Andrea, I haven’t tried freezing and then cooking this lasagna in the IP. I think it would have to be frozen in the PIP pan so it keeps the shape. It may need to cook a few minutes longer. I also wonder if you could just cook it, then freeze it and reheat on the steam setting. Hmmm. Ohhhhh…. good idea! I’ll keep you posted on our results! If you froze it in the springform pan, then released it, you could pop it back into the springform pan for reheating. If you use a push pan do you need to wrap the bottom of the pan in foil to keep from leaking? If yes, does that alter the cooking time at all? I’m still a newbie to IP cooking. Hi Dawn, I have never wrapped my pan. Maybe a tiny bit comes out, but not enough to make me go through the extra step of wrapping. Having said that, it will depend on the quality of the pan. Try it without first. Great! Thanks so much for the reply, Sandy. I bought the Fat Daddio pans I’ve been seeing recommended all over the place. I used it recently for an egg dish and wrapped it for fear of leakage. It did leak some in the foil, but I suspect it was also the reason my dish wasn’t done in the time suggested. Still learning! Hi Marie, if you mean foil on the outside of the pan, in case it leaks, I wouldn’t add any time unless you wrap it up really good. Then maybe 5 minutes. I’m making this for the first time. It’s in the ip now. I’m new to the ip this is only my 3rd time using it. I am using a 7″ spring form pan and it leaked a little before I even put in in the ip so I did loosely wrap the bottom with foil. I added 3 minutes to the cook time after I read some of the comments. My pan was quite full and I couldn’t put all the cheese on top…..maybe because I’m using homemade venison Italian sausage and it doesn’t shrink like pork? That’s possible. Also, a 3″ tall pan gets you more layers. As for the sauce leaking out, you probably are using a thinner sauce than I do. Wrapping the bottom was a good call. I hope it turns out delicious! Could you substitute cottage cheese for the ricotta? I’m concerned about not putting the sauce in the meat and using the meat as a dry layer. I make an amaxing lasagna in the oven (if I do say so myself) so I’ve been reluctant to try it in the IP because it doesn’t seem saucy enough. Have you ever tried mixing the sauce and meat together, combining a step? Hi Kim, I know what you mean. That would be a good workaround. I think adding sauce to the meat would be good, and maybe a little more sauce as this is not a real saucy lasagna. I also mix the sauce and meat when I make it in the oven. Please let me know how yours turns out. I mixed the meat, sauce and spinach together. It turned out great! I also use an oven safe crock dish and have had good luck with this and other PIP recipes. Thank you for posting your outcome! Do you use the short trivet or the tall trivet. ? I used the short trivet with handles. The one that came with my pot. Thank you for sharing this recipe. It sounds amazing. Could you use a 6×3 Fat Daddio’s pan? If so, do you need to alter the cook time? Thanks! Hi Sarah, yes you can use a 6×3 pan. You might have a little filling left, or a tall lasagna! I don’t have anything except my instant pot and the trivet, any way to still make this? Hi Jasmine, you will need some kind of oven safe dish/pan. Do you have a cake pan, or anything oven safe? It will be to thick to bring the pot to pressure if it is directly in the pot, I’m afraid. Is this quicker than lasagna in the oven? I’ve not made anything like this in the IP before. What size IP did you use? We have the 8 qt. It’s a little quicker, not a lot. Hi Bonnie, from what people who have done this are telling me, they do not change anything! If you want to be safe, you can soak them in some hot water for a while first. Just to clarify, are you saying people have made it using regular lasagna noodles without boiling them first? Hi Joan, yes. I have people telling me that all the time! Hi Bonnie I used no boil noodles and they were very tough. Any ideas as to what went wrong? I used no boil noodles making this recently and they turned out just fine. Did you put the sauce directly on top of the noodles? I tried this recipe tonight and my noodles were way too tough. Should I increase the cook time? I used the no boil noodles and put the sauce directly on the noodles. The flavoring was good, but the noodles were too tough. Dana, it could be that your sauce was too thick, or you didn’t use enough? I have never had anyone tell me that the noodles were tough. Maybe add 2 minutes to the cook time. and just a little more sauce over the noodles. Hate to ask, but you did have water in the liner pot, yes? Hi Brittani, as long as there is space around the pan for the steam to circulate, and you can safely get it out of the pot (a sling is good, or a rack w/handles), then you should be okay. Could this be done using two 7 by 2 inch pans at once? Right now, 7 by 3 inch pans are not available. The darker pan in your links goes to a 7 by 2 pan. Hi Lori, if you use two 7×2 pans, you may need to have enough ingredients for an additional layer (or lots more cheese! But it will be pretty cheesy). You can. The 2 inch pan will yield a thinner lasagna, but I would still add 5 minutes. Those stackable pans are nice, though the one on the bottom sometimes scorches on me. I love not having to cook the lasagna noodles, so instead of lasagna noodles, I use wonton wrappers. It’s like fresh pasta and it works great. Hi Mary, that’s interesting! Thanks for the tip! I also like not having to cook the pasta! I have never cooked a lasagna noodle, ever, and I don’t use the “no-boil” type, either. My first recipe for lasagne simply called for an additional cup of water to be added to the sauce, and to cover in baking. My lasagna has always turned out well, in the over, crock pot, whatever. I have not yet tried the instant pot, but, as i said, I have never boiled a lasagna noodle. Ever. Hi Jaci! I love it, both of our Pauls make great lasagna! Well please say hi from me, and I hope you enjoy the lasagna! I have made this recipe 2 weeks in a row now and plan on keeping it in my recipes rotation. I use the Daddio cheesecake pan you mention in this post and love it! My teen son loves this dish so much that I have to limit him to 2 pieces otherwise I know he would eat half of the pan or more himself. Wow Sara, that’s awesome that you all like this so much! Those teen boys sure can eat! My son is almost 25 and still wants thirds! Thank you for your review! I just made this for dinner tonight. Even though I forgot the middle layer of noodles (sigh), it still turned out wonderful, maybe just a bit loose. Hubby liked it and he is extremely picky. Made it without the spinach for him. He will eat fresh spinach for a salad but not cooked. Thanks so much Sandy. So far a l your recipes rock! Hi Linda, I’m happy that you liked this lasagna! Thanks so much for your review! I would love to make this recipe. I have a 3 qt. IP. What should I use for the pan to make the lasagna in? Hi Patsy, if you have a 6″x3″ pan or oven safe dish, that will fit perfectly! This is a great recipe! I used a Fat Daddio 6×3 pan (accidentally got the regular cake pan instead of push pan) and a foil sling with the trivet, and everything worked just fine. Hi Deanna! So awesome! I’m thrilled that you and your hubby liked this lasagna recipe! Thank you so much for the review! IP, is this something you improvised (made of what?) or something yon need to buy? Hi Terry, I added a photo and description of the sling to the lasagna post. I hope that helps! I’m planning to make it my Crockpot today. Do you have any idea how long it would take to cook in it? and I’m assuming I wouldn’t need to place another dish inside it because you can set the ingredients in the crockpot cooking insert. Am I right? Hi Marie, I would cook it in the crock pot for 4 to 6 hours on low setting. Enjoy! Wondering if I can make this recipe and put it in the oven instead of the IP? If so , how long would you cook in the oven? Hi, yes you can. We bake ours from 40 to 60 minutes at 350, depending on how thick it is. Leave yourself some extra time in case you need to add a few minutes. Hi Sandy, came across your lasagna recipe and was quite surprised in using a pan inside your instapot. I so. Love mine and will try this in my spring form pan. I may try the wonton wraps as suggested by one of your readers as I don’t like the no cook noodles. So glad I came across this and am excited to try it. I will join your Facebook page and post a pic to show you how it turned out. Thanks for sharing. Just made this for dinner. Followed the recipe exactly. It was so delicious and easy. Much easier than regular recipe. Thanks so much for posting. Hi Karen, glad to know that this lasagna recipe worked for you! We love making it this way now! Thanks for your review! Do you need to throw it in the oven? Hi Jason, nope. Some folks like the cheese to get browned. Sandy – I have the ekovana Stackable Stainless Steamer Insert Pans. Would I put both pans in the IP with the lasagna only in the top pan? Or just use one of the pans on top of a trivet? I would imagine that a double batch (one in each pan) would be too dense? Can’t wait to try this recipe. Thank you! Hi Patty, you can use just one pan on a trivet. I haven’t tried it stacked, but I imagine the bottom pan would get a bit hotter as it is closer to the heating element. But it may work just fine! I’m thinking of turning a metal round empty cake pan upside down on trivet, then springform on top. Hi Terri, If I’m understanding what you are asking, you have the trivet, and a 6×3 pan, and foil. You won’t need the other cake pan. If your trivet has handles, use them to get the 6×3 pan of lasagna in and out of the pot. 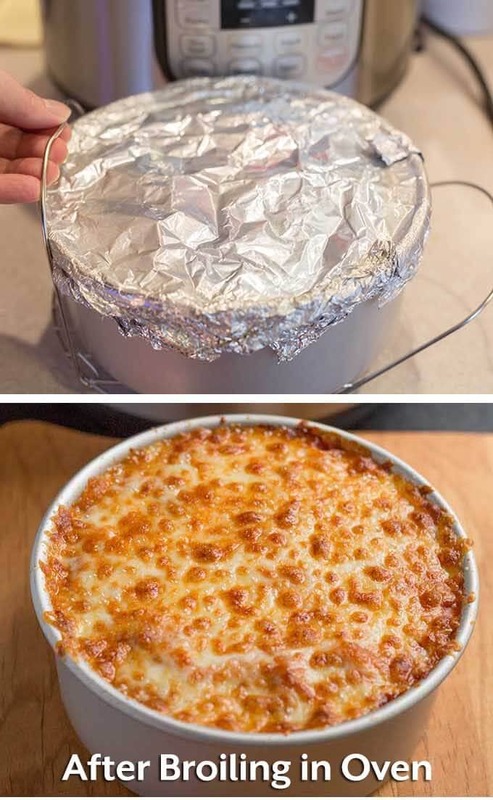 Yes, cover the top of the 6×3 with foil, sprayed with cooking spray (or greased with oil or butter, so the cheese won’t stick. I hope that clears it up for you. Please let me know if you have any other questions, or if I didn’t get it correct! I’m loving your instapot recipes, I made the American Goulash and the gang loved it! My smallest springform is 9″ leaving about 1/4″ around the pan inside the instapot. I do have a 8″ cake pan with 2″ sides. Which do you suggest for this recipe? Hi Kathy, I’m glad you are liking my recipes! I think 1/4″ around the pan is enough, and make sure you use a sling or something to get it out. That’s great, Susan. So the gluten free noodles need to cook longer? Thank you fo ryour review! Thank you for posting this. I am going to try this with the GF no bake. Made this for the first time for Sunday dinner, it was terrific. I’ve been cooking for decades (using stove top pressure cookers and slow cookers), and using an IP since January This is one more example of why the IP is a superior kitchen appliance. I didn’t use the spinach, and went with 8 oz. ricotta cheese, and used 1 lb Italian sausage, but otherwise followed the recipe. Hi Robert! I’m so glad you liked it! I love hearing from experienced pressure cookers! I agree about the IP being superior! Thank you so much for your review! Hi Suzanne, I’m so glad you liked the lasagna! Thank you for your review. I made this tonite. Left out the spinach, it looked good and tasted so good. But it was a mess when I moved the outer push up pan. I let it sit and cool even, not sure what happened. Maybe the sauce I used wasn’t thick enough? It was excellent, though! I made this tonight and added a layer of pepperoni on top of the sauce layers, under the Italian sausage. (I used all sausage, no beef) It tasted like pizza and that was awesome for my 3 and a half year old son! I do not have a springform or push pan, so I used the 7×3 Fat Daddies cake pan. You can’t reveal the layers on a platter for a nice photo, but that does not make it any less delicious! Best lasagna I have made in the pressure cooker to date and this won’t be the last time for this recipe. That’s great! I’m so glad you liked this lasagna recipe! Thank you for your review! This lasagna was great! I was a bit skeptical because it was so easy to make. I decided to try it and it was very tasty! My husband loved it and I was so pleased that it included spinach in the recipe as I love spinach. Hi Dixie! I love when my recipes are husband approved, lol! Thank you for your review, and I’m so happy that you both enjoyed it! Probably a silly question, but I read the recipe and I’m not sure. Our Publix didn’t have no-boil lasagna noodle, so I got regular ones as the recipe suggested. Do I boil them before I make this or not? I’m afraid that if I do they will be really mushy. Maybe al-dente? Or no boiling at all? Hi Bonnie, you don’t need to boil them first. The feedback I’ve had is that they work just fine going in uncooked! I loved this lasagna! It was so much easier to make than I thought it would be. Making it in my Instant Pot was nice because it’s getting hot here in Utah and I didn’t have to turn on my oven! Thank you for the wonderful recipe! Hi Joy! Thank you so much for your review! I love not having to turn on the oven when it gets hot, but still being able to cook lasagna! BTW, I love Utah, we went there recently and saw the Bryce Canyon. Wow! Do you have to grease the pan at all? This sounds so easy & tasty! Not turning on the oven in this very hot weather would be great! Hi Brandi! You got that right! No oven in the summer! Thank goodness for the IP! You don’t have to grease it, but I think it isn’t a bad idea. Just give the pan a quick spray. Derek, first rule of cooking from any recipe is to read the recipe completely to make sure you have all necessary ingredients AND tools to complete the recipe. Why attack the writer because you didn’t use due diligence? See, I read the whole thing and realized I need a bigger pan before I attempt this recipe, easy peasy. Oh my gosh! This was fabulous! I used a combination of beef and mild Italian sausage. I will definitely be making this again and again! I am also now following for more tasty food! Absolutely FABULOUS! Being a Vegetarian I went ahead and substituted the Ground Beef for the Morningstar Farms Veggie Crumbles. Since those are already seasoned I added it into the recipe “as is”. It is so delicious. Thank you for a great recipe. This one is definitely one of my favorites and SO EASY and Fast. Hi Werra! What a great substitution! Thank you for your review! Fantastic recipe! The directions make it foolproof. I used cottage cheese which added a little moisture, so beware. I used an Anchor Hocking 7″ oven proof glass dish (7 cup round) and it worked perfectly. Didn’t stick at all! Thank you for this delicious recipe! Can’t wait to try others. Thank you, Trish! I’m so happy that you all liked this recipe! I appreciate your review! I just tried this tonight. I decided to put it on for 24 min rather than 22 because I don’t like tough noodles. I also let it slow release for 15 minutes. Even with the extra time it is REALLY not done!! as in, noodles break when I bend them. I just put n for another 15 minutes. hopefully that is enough. This is highly unusual. Something went wrong. Did you put water in the pot under the pan of lasagna? Did you put the sauce on the noodles? Thank you for this recipe and excellent instructions! I made it tonight and it turned out just as stated. Delicious!!! That’s great, Judy! Thank you! So delicious! It looked just like your pictures and tasted better than any restaurant lasagna I have ever tasted. This instant pot thing is getting too good to be true. It reminds me of when microwaves first came out. My wife and I teamed up on this one and it came out soooo good. This is our first ‘pot in pot’ adventure. Thanks for sharing. That’s great, Rob! I’m so happy you and your wife enjoyed this lasagna recipe! Thank you for commenting! Wow!! THIS was a HUGE hit at our house! This is the lasagna recipe I’ve been wanting to find for years & according to hubby is “the best lasagna he’s ever had”. So, from our family, THANK YOU!! Looking forward to trying more if your IP recipes! Thank you, Charlotte! What a nice compliment! I’m so happy that you and your hubby enjoyed this lasagna recipe! If I chose to double the recipe do I have to double the cooking time? I have a big family that likes to eat or should I just make 2 separate dishes? Hi Laura, the pan isn’t large enough to double the recipe, but you can make 2 batches, or try the 7″ stackable stainless pan to cook 2 at the same time. I have not tried this, however. Made your lasagna. Hubby liked the look of it coming out of oven. I am not a lasagna eater. He likes it, He likes it. Oh, I have two pugs. Carlie and Zoey. That’s great, Gloria! Say hi to Carlie and Zoey for me! Yes, as long as it fits. 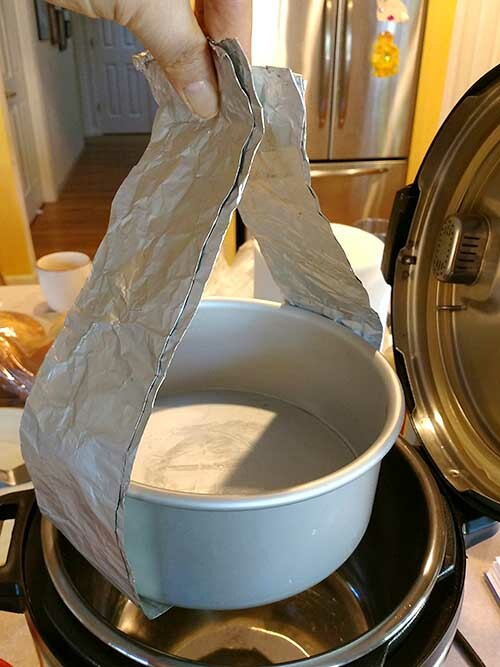 Wrap the bottom in foil to keep it from leaking. When you but a pan, try to get one that is 3 inches high so you can get more layers! It looks like you changed springform pans before putting the cheese on top and placing it in the oven. May I ask if there was a reason for this? Yes, the photos were done on different days because I was recipe testing and took the photos during the different tests. I left it that way to show people that they can use a springform or a push pan. Also, I have a 6qt IP. Is this recipe for that size? Or do I need to adjust the size of the pan? You can use the 6 qt or 8 qt. In the 6 qt I use a 7″x3″ pan, and in the 8 qt you can use a 8″x3″ pan. Well I have never been so disappointed in my entire life in cooking. The flavor was amazing but when I took it out of the pressure cooker and put it on the can as directed, let it cool a bit as directed and then started to pull the pan down “ everything ran all over the place” I ended up having to scoop what was edible with a spatula. I could have just put it in the pot and cane up with the same thing without the mess. Not sure about anyone else but I followed your directions to a T and it was a huge mess. If you could explain to me what went wrong i’d Be much appreciative. That sounds like a terrible ordeal! You must be a very good cook if this is the worst thing that has happened to you while cooking! I’m so sorry. So, the things that could have prevented this from happening are 1) Don’t use thin pasta sauce. 2) Let the pan sit and rest a few minutes after broiling the cheese, before releasing from the pan. 3) Make sure you have a plate or other dish underneath the pan to catch any drippings. I can tell you that nobody has reported this happening. Easy to make and the flavor was there. Made it for the family and no complaints. That’s great! I’m glad you all liked it! This looks delish, but I’m very disappointed that I can’t pin it. Why not? Hi, I don’t know why you can’t pin it! Here is the pin URL so you can: https://www.pinterest.com/pin/650559108653072753/ I’ll look into it. Thanks!